What Does it Mean to be Chosen by God? The phrase “chosen by God” is used in a variety of ways. Some people use it in the concept of saying that God chose them to do some sort of special thing. Unfortunately, my experience is that people who usually proclaim this, often when you first meet them, do so is a bragging sense and quickly reveal by what they say that they are a theological mess. Other’s refer to being chosen of God in the sense of world leaders playing a part in end times events. Still others use the phrase to refer to people whom God has chosen to be saved. 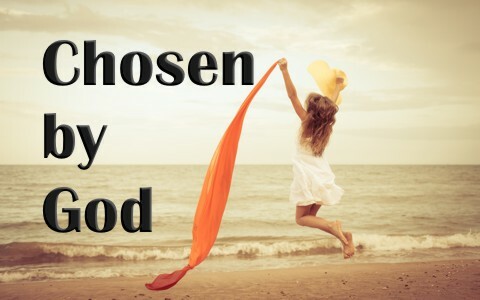 What does it mean to be chosen by God? God’s Word provides us some understanding in this matter. Are there people chosen by God to do specific things? We can see from these examples that to be chosen by God, simply means at some point God made the choice for something to happen according to His perfect wisdom, foreknowledge, and will. We also see that it is because of His reason, not ours. We have to remember that God has known from the foundations of the world what our choices would be in any given situation. Because of this, He also knows how to accomplish His perfect will, while yet still allowing man to make choices, either good or bad. For example, as we saw in Romans 8:28-30, God foreknew who would love Him. This means He foreknew that given every situation we could ever be in, He knew who would trust Christ as their Savior and who would not. Those He foreknew would love Him, or trust Christ, He predestined to be conformed to the image of His Son. This means that by God’s perfect will and power, He would bring it to pass that believers would one day stand before Him in a perfected state as His Son is perfect. Yet, He also knew that there are some people that no matter what, they will never trust Christ as their Savior so God predestined them that they would not stand before Him in a perfected state. Instead, they would stand before Him in their sinful state at the Great White Throne Judgement where they would hear those fateful words, “I never knew you, depart from Me, ye that worketh iniquity” (Matthew 7:23; Matthew 25:41; Revelation 20:11-15). The phrase “chosen by God” is used in a variety of ways. The Bible is very clear that there are people chosen by God to do specific things. This simply means at some point God made the choice for something to happen according to His perfect wisdom, foreknowledge, and will. Because of this, God’s choices are perfect and will result in the fulfillment of His perfect will. Something more to read: Does God Predestine People to Hell? A tough topic and excellent explanation. I like how you explained “who God foreknew He did predestine.” It wasn’t that God made us predestined, it is that He knew beforehand our choices and by knowing that information… He predestined. That opens up the whole can of worms on free will, but I believe the two ideas exist well side by side. God allowing us our choice and simply knowing what that choice is/(will be). A thorough and Biblical addressing of a tough Theological topic, Amen!! Previous post: What Does The Bible Say About Togetherness?